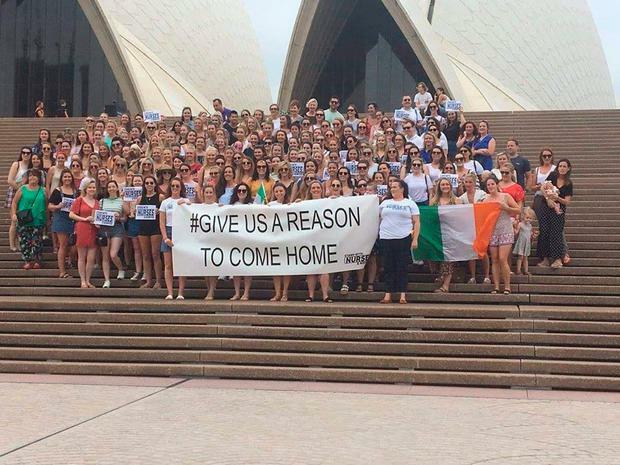 HUNDREDS of Irish nurses in Australia have challenged the Irish Government to give them a reason to come home. Organisers said that 250 nurses attended a demonstration in Sydney on Saturday to show solidarity with striking nurses in Ireland. The Irish Nurses and Midwives Organisation and the Psychiatric Nurses Association have both announced industrial action in a row over pay and conditions. The INMO will begin their strike on January 30, with five more days planned in February; while the PNA has put an overtime ban in place on January 31 and is also planning further industrial action next month. The Support for Nurses, Midwives and Frontline Staff Facebook page shared a video from one of the organisers of the rally talking about her reasons for being there. She explained: “Today over 250 Irish nurses working in Sydney stand together to send a message of support to all Irish nurses and midwives striking on January 30. “We stand with the INMO and the PNA, who are fighting for us. “We will not come home until our skills are recognised and we are paid equally with other allied health professionals. “It is not competitive pay rates that Ireland is offering and therefore there is a recruitment issue and a crisis in Ireland. “At the end of the day this directly affects patient safety and that’s why we’re here. Finance Minister Paschal Donohoe has ruled out a 12pc pay hike for nurses to avert strikes because of the “great risk” of knock-on claims by public servants. Mr Donohoe claimed every other public servant would be demanding the same judge-led assessment.